The new study shows that a combination of high electricity tariffs, falling prices of solar PV and poor supply of on-grid electricity is driving adoption of on-site solar power by businesses in Sub-Saharan Africa. A new study has shown that a combination of poor supply of electricity, high electricity tariffs and falling prices of solar photovoltaic (PV) system is driving adoption of on-site solar power by businesses in Sub-Saharan Africa (SSA). This report was released on Thursday by research company BloombergNEF (BNEF), and commissioned by responsAbility Investments AG, a Swiss asset manager for impact investments in emerging economies. On-site solar generation involves the installation of equipment to generate clean, renewable energy at the location where it is consumed. The report, entitled “Solar for Businesses in Sub-Saharan Africa,” finds that companies are investing in on-site solar power not because of regulatory support – as has been the case in many developed economies – but because of economics. 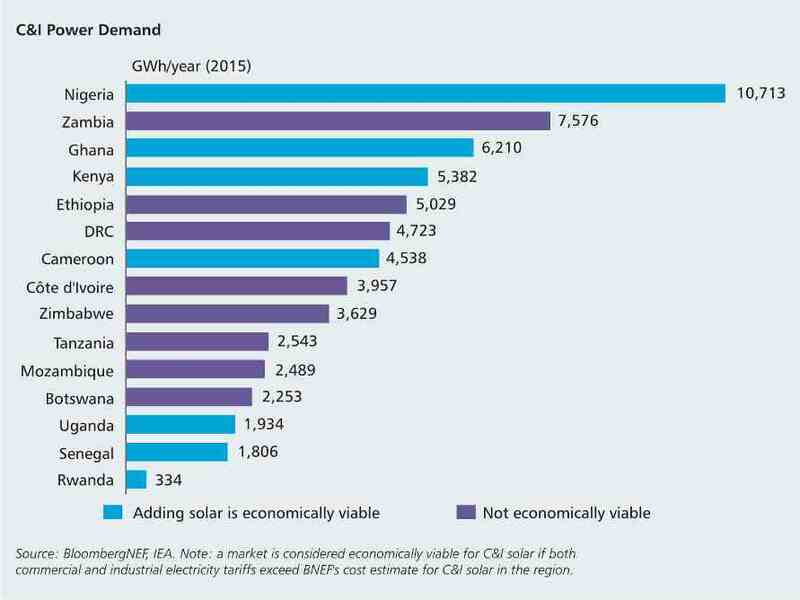 The BNEF report shows that on-site solar power is cheaper than the electricity tariffs paid by commercial or industrial clients in seven out of 15 markets in SSA studied by the research company. Nigeria is considered the most economically viable market for commercial and industrial (C&I) solar power in the SSA region, with 10,713 GWh/year C&I power demanded as of 2015. Ghana, Kenya, Cameroon, Uganda, Senegal and Rwanda are other economically viable C&I solar markets in the region. As of November 2018, developers built a record number of 74MW of on-site solar power, serving business customers directly and offering them cheaper power than the grid. Kenya, Nigeria, and Ghana installed 15MW, 20MW, and 7MW, respectively as of November 2018. Sponsor of the report, responsAbility – which manages assets worth $3 billion through a variety of investment vehicles – has financed the off-grid solar sector in SSA for five years, focusing primarily on residential customers. The company expects solar to be increasingly deployed on C&I sites, where it often complements diesel power generation. According to the authors of the report, the financial sector has yet to take on a major role in providing funding for C&I solar systems. So far, most business customers have bought systems for cash, without using third-party finance. There are, however, big opportunities for specialized financiers in the region to do more. responsibility together with other climate funds commissioned BNEF to identify and assess potential target markets for C&I solar in Sub-Saharan Africa. Overall, stakeholders are optimistic about the future and BNEF expects 2019 to be a record year for the C&I industry. The authors also believe that financing solar installations can contribute to climate change mitigation by replacing fossil fuel. The current funding round of US$50 million in concessional loans marks the sixth of seven annual cycles. Off-grid technologies and business models are emerging as part of solutions to closing the energy access gap. The project will increase Rwanda’s clean energy generation capacity by about 50 megawatts.